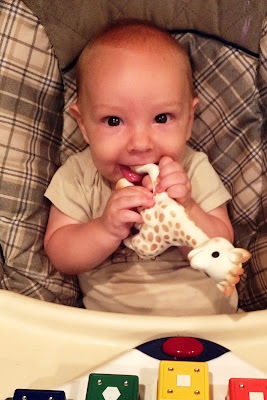 Going Mamarazzi: 4 months (yesterday), baby! Jacob-ee is now almost 18 pounds (17 pounds 14 ounces)!! That seems huge to me but I guess he's starting to regulate because that weight puts him in the 89th percentile. Hannah hit18 pounds around 11 months (she was a little over 16 pounds at 9 months and almost 19 at 12). His 26 inches puts him in the 84th percentile for length (Hannah was 25 inches at 4 months). His head is still in the 95th percentile (43.6 centimeters; Hannah's head was 41.6 at 4 months) which means there will be plenty of room for a big ol' brain to grow and thrive! I intended to spend some time on this post writing about his temperament (pretty easy and far more laid back than Hannah though anti-car rides, just like his sister), his sleep patterns (FAR easier than Hannah), and just him in general, but it's late...So this will have to do. Wow. Definitely takes after his Daddy.